, professor of divinity at Stetin, and a very learned man, was born at Cuslin in Pomerania, in 1597. He began his studies in the college of his own country; and, in 1614, removed to Stetin, where he studied theology under professor Cramer. In 1616, he maintained a dispute “de Deo uno & trino,” which gained him great reputation; and went the year after to the university of Konintrsberg, where he disputed again “de veritate. 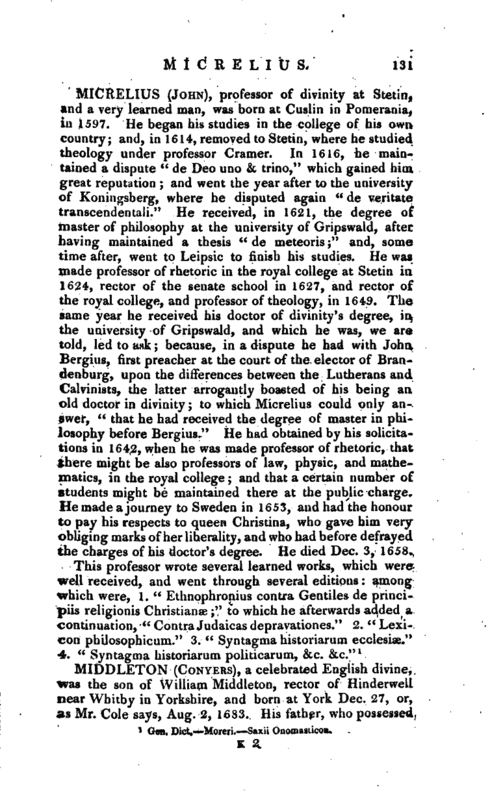 transcendentali.” He received, in 1621, the degree of master of philosophy at the university of Gripswald, after having maintained a thesis “de meteoris;” and, some time after, went to Leipsic to finish his studies. He was made professor of rhetoric in the royal college at Stetin in 1624, rector of the senate school in 1627, and rector of the royal college, and professor of theology, in 1649. The same year he received his doctor of divinity’s degree, in the university of Gripswald, and which he was, we are told, led to ask; because, in a dispute he had with John Bergius, first preacher at the court of the elector of Brandenburg, upon the differences between the Lutherans and Calvinists, the latter arrogantly boasted of his being an old doctor in divinity; to which Micrelius could only answer, “that he had received the degree of master in philosophy before Bergius.” He had obtained by his solicitations in 1642, when he was made professor of rhetoric, that there might be also professors of law, physic, and mathematics, in the royal college; and that a certain number of students might be maintained there at the public charge. He made a journey to Sweden in 1653, and had the honour to pay his respects to queen Christina, who gave him very obliging marks of her liberality, and who had before defrayed the charges of his doctor’s degree. He died Dec. 3, 1658. Gen. Dict. —Moreri. —Saxii Onomasticon.